What’s the saying.. Time flies when…? Time flies when… you’re working hard on your master’s degree! Yes, that’s not the real saying but it explains why I stopped posting here all together. My last quarter of school was quite stressful trying to balance difficult courses with work and trying to have a tiny bit of a social life. But working hard pays off. I completed my MLIS degree successfully! Now that I have finished my degree I’m going to change this blog a tiny bit. I’m going to start writing about the books I now have time to read, for fun! As well as any relevant library, book related topics that I come across. 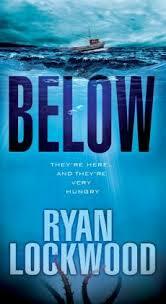 Although I’ve finished another book more recently, this review post is going to go along with Below by Ryan Lockwood. I had never read anything by Ryan Lockwood before this, but stumbled across it in my local library catalog and decided to give it a try. I generally enjoy stories dealing with creatures of the deep and this was no different. However, I found this novel funny at times when I probably shouldn’t have. With the recent calamity over the move Sharknado, I think many can envision what Below would probably be like as a film, and understand that a film adaptation of Below would be a welcome addition to the likes of SyFy channel movies. In this book, when something goes wrong, it all goes wrong. Nothing seems to go right for any of the characters for a good portion of the book. It was refreshing to see that although there wasn’t much of a fight, that the idea of saving and studying animals instead of outright killing was brought up. The planting of this idea could translate into helping creatures that are not well known or studied. I hold a profound respect for authors that disperse knowledge as well as entertainment in their writing. Ryan Lockwood has succeeded with this novel to do just that.